The London County Council employed Lubetkin on a number of its housing projects scoring notable hits such as the Cranbrook Estate** in Bethnal Green completed in 1963. The Estate was built to house a diverse population of families, elderly people and people living on their own in its bungalows, tower blocks and medium rise flats arranged around carefully landscaped open spaces, with the towers strategically positioned to reflect light and cast shadows in the fashion of spokes rotating within a turning wheel at all hours of the day. Nowadays, such vision is sorely lacking when commercial developers, Housing Associations and local government get together to plan homes for the ordinary people of London and there will be a shortage of 559,000 homes by 2021*** if they continue to rely on public private partnerships as one of the main solutions to the current housing crisis. These partnerships depend on trading permission to build in a particular borough with the construction of a fixed percentage of social housing units, brokered by the kind of clever lawyers the developers can afford to employ. The media comment on this state of affairs with an air of hopeless resignation, as if this were no other ways to deal with the problem, seemingly ignorant of London’s distinguished record of clearing its streets of Nineteenth Century slums and rehousing thousands made homeless by bombing during The Second World War. Londoners were moved to huge estates on the outskirts of the city in areas like Dagenham in Essex, while others were rehoused in London in new homes built by individual borough councils, like Bethnal Green, with the financial backing of the LCC. Arethusa House forms part of the Westferry Estate, situated towards the bottom of the Isle of Dogs and, most days of the week I get plenty of time to take in the view of its sturdy façade during my wait for a bus to go up to Canary Wharf. The estate is made up of five storeys of London stock brown brick flats, built in a traditional style embellished with the LCC shield, which frame a row of shops at street level and was erected on the site of Ingelheim Cottages, after the Thames overflowed its banks and covered the whole area in filthy water foul with oil stored in nearby refineries. The cottages were “a terrible old shanty, lacking every convenience”**** rather than the rustic idyll conjured up by their name. They were demolished by Poplar Council in 1928 and replaced with eight new blocks which would transform the lives of the new tenants who moved in in 1936. It was common for Poplar’s families to be crammed into two rooms in jerry-built dwellings with no running water or sanitation. They would have shared a tap and a toilet with numerous other families and bathed in a public wash house like the one the Borough Council opened in 1852. It was not unusual for people to bring up fourteen children in these conditions and, unsurprisingly, infestation, infection and disease were rampant. The new flats still had no bathroom, but contemporary photos show a clean lino-tiled hallway which separated the living room, kitchen and bedrooms from each other, providing residents with a level of space and privacy they had never experienced before. The kitchen had a sink under large sash window, where light poured in, running water to clean up pots, pans and crockery and cupboards to keep them in. Women must have been the chief beneficiaries of these improvements, as they were the ones who had most responsibility for protecting children from disease and keeping a clean, well-ordered home. Everyone benefited from living under a new landlord, Poplar Council, which, unlike its private predecessors, was legally obliged to charge reasonable rents and keep their properties in good repair. By the 1950’s the modernists were firmly in charge of planning municipal housing in London and, under the right circumstances, their project was a success. 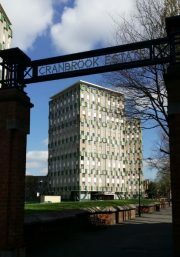 The Cranbrook Estate has undergone substantial alterations since 1963, but it feels like safe place to be and still has a strong sense of community. When Tower Hamlets tried to hand it over to a Housing Association in 2005 this community got together to oppose the move and won. In a less favourable environment, the modernist dream could go badly wrong. As I look upriver towards Deptford from my home on the Isle I can see the twenty-nine storeys of Aragon Tower, once part of the formerly notorious Pepys Estate, jutting up over the Thames. The estate was planned along the best Le Corbusien lines as a place where residents would rise effortlessly in lifts to airy walkways and glide along from block to block high above the ground to bright habitations warmed by waste recycled from local power stations. The estate was made up of three 24 storey towers, 10 eight storey blocks and several low-level dwellings and opened by Lord Mountbatten in 1963. The high hopes on which it was founded were eroded by recession in the 1970’s and the deep cuts made in grants to Borough Councils in the early ‘80’s made by Margaret Thatcher’s government, which also forbade them to build new housing, as part of their programme to turn the nation into a “home owning democracy”. With insufficient funding from Lewisham Council to keep the common parts properly maintained and the employ enough caretakers to ensure the smooth day to day management of the estate, it became unfit for families to live in and classified as “hard to let”. Entrances filled with urine and lifts broke down, their ceilings dripping with spit. According to Iain Sinclair,***** the openings of the rubbish chutes, fitted originally to make household waste magically disappear, had to be narrowed to a width which could no longer accommodate a dead human being. I do hope this was no more than an urban myth concocted to reflect the depths to which the estate’s reputation had sunk, rather than historical fact. The hard-to-let flats were now rented out to young professionals saving up deposits for homes in more salubrious areas of London, such as Clapham and Blackheath, who wouldn’t fall into a state of despair likely to be induced by the prospect of the Pepys Estate becoming their “forever home”. During the 1990’s Lewisham Council sold off Aragon Tower to Berkley Homes for redevelopment as privately-owned flats, and used the profits to demolish the eight storey blocks and renovate the rest of the estate despite strong local opposition. Heaven only knows what investors must have made of their surroundings on arrival to the new homes they had bought in Aragon Tower. Arethusa House and Aragon Tower were built originally for rental by Londoners who could not afford to buy their own homes. Apartments in these blocks now appear on the market for around £500,000. What will happen to all the people who need to rent a decent home at a reasonable price in London today? Their problem will never be resolved by public private partnerships. There’s no profit in it. It’s time to admit that the politicians, functionaries and technocrats of the LCC and borough councils got it right in the Twentieth Century: housing the ordinary people requires vision, will and a programme of works supported by massive public spending. There are signs of the tide turning. Some councils have announced plans to build homes for people who can’t afford to buy or rent privately, including Newham which has one of the most pressing housing crises in London. Sadiq Khan, Mayor of London, recently granted Newham £107 million of Greater London Authority funding to build 1000 new homes. ****** It’s a start. You can visit the “Living with Buildings” exhibition at the Wellcome Institute until 3rd March where recorded voices of people who have lived on the Pepys Estate can be heard. Ian Sinclair wrote his book, cited here, “Living with Buildings” to accompany the exhibition. Time is Love, Finborough Theatre. Review by Barbara Lewis. Balla: Villa Borghese. Review by Carla Scarano.